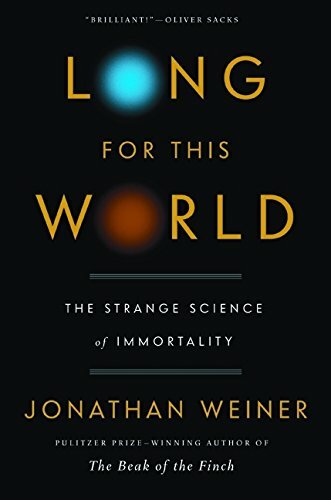 “We are brief, and therefore we admire a stone tower, a storied tavern, a Greek myth, an antique rippled windowpane, almost anything that seems to have more time than we do,” author Weiner writes early on in this entertaining and provocative story of the scientific search for a longer life span. The problem of limited lifespan has occupied humans for millennia, but according to Mr. Weiner, it may actually be solved—and sooner than anyone expects. Gerontologists study how and why we age. They define life expectancy as “the average that babies born in any given generation of any particular year can expect to reach.” Stone Age humans, if they outfaced, outraced, and outlasted the day-to-day dangers of that era, could look forward to an average of about 20 years of life. By the Roman Empire, that number had grown to a mere 25. Even given the artistic, social, and scientific flourishes of the 16th century and the Renaissance, life expectancy still grew to only about 33 years. But by 1900 it reached 47, and right now we can look forward to about 76 years to enjoy and explore. Why the big, recent jump? Don’t thank evolution, says Mr. Weiner; it’s not our bodies that have changed, it’s the way we live: more nutritious food, medicine, public sanitation and better personal hygiene have all improved our chances for a reasonably long life. But many folks still long for the “hundred and twenty years” promised to Adam and Eve in Genesis. According to Mr. Weiner, many gerontologists think we can add about seven more years to our 76 with improved medical technology. But Mr. Weiner’s here to explore something far more impressive—if it can be done. Solving this problem means looking at what happens to aging bodies at the cellular level. Part of the problem is that the mechanisms that keep our cells healthy just wear out little by little. Sometimes rogue oxygen atoms get loose inside a cell. These rogues are the infamous “free radicals” that indiscriminately bond with anything they strike. We “rust” inside, and this damage accumulates over time, reducing the cell’s ability to function smoothly. Mitochondria are the power plants in each cell that turn the food we eat into cellular fuel. They also build new mitochondria. Autophagosomes are tiny mechanisms in each cell responsible for cleaning out faulty and damaged equipment. Their job is to break down the faulty bits so they can be recycled for new ones. But sometimes they don’t recognize a broken mechanism—like a mitochondrion—as broken. Meanwhile, the bad mitochondrion continues to operate, and make fresh copies of its imperfect self, perpetuating the problem. Picture that happening throughout the body, and it’s no surprise that we just wear out over time. How to solve this problem? De Grey thinks one way might be to prevent mitochondria from going bad in the first place--by removing the genes prone to damage inside them. The trouble is, we don’t necessarily know what else those genes may be needed for. Another plan proposes creating a bacteria that could identify the broken bits missed by the cleaners. Weiner cheekily calls researchers in this field “the Good Housekeeping people,” since their work focuses on better health through better housekeeping. We have found bacteria that happily dine on plastic and rubber. Why not use microbial remediation to repair an aging body too? Other hopes rest in chemicals like the storied Resveratrol, a substance found in grape skins that has been found to extend the lives of lab mice. Restricting calories—simply not eating very much—also seems to help mice live longer; but that demands careful attention to be sure you’ll get the right amount of nutrients to stay healthy, despite eating less. Another substance called rapamycin also seems to work for mice. It enhances autophagy, pushing the cleaners into overtime when needed—but it also has unpleasant side effects when taken long-term. And no one knows if any of these solutions will work in later years when genetic diseases like Huntingdon’s, diabetes, cancer, and Alzheimer’s, start to kick in. Mr. Weiner makes this complex topic both accessible and exciting. Explanations are vivid and non-technical, easy to visualize. He also touches on the many “what-if” issues surrounding a super-aged, yet healthy, population—from dangerous boredom, say, to a job market where no one retires.